While bandwidth prices are slowly declining, it is still quite common that some Internet Providers try to influence the traffic consumption of their customers by manipulating transfer speeds. One common method that Internet Service Providers use is traffic throttling. Traffic throttling methods limit certain kinds of traffic, for instance P2P traffic or Internet streaming, to reduce customer bandwidth. ISPs select high bandwidth traffic usually for the throttling as they yield the highest return and may affect only a small part of the company's customer base. Up until recently customers had little options to detect traffic shaping (or throttling); this changed with the release of online test tools provided by Measurement Lab. Internet connection speed analysis is part of the tool collection at M-Lab Measurement Lab gives consumers access to online troubleshooting tools to identify different kinds of connection speed issues including traffic shapring. Measurement Lab was founded by the New America Foundation's Open Technology Institute, the PlanetLab Consortium, Google Inc., and academic researchers. It provides access to online tools, some of which have been mentioned earlier on Ghacks. The tools that are provided on the MLAB website are (crossed out tools are no longer available(. BISmark -- Host a home router that tests network performance over time. MobiPerf -- Test designed to measure network performance on mobile platforms. Neubot -- Run periodic tests to test network performance and network throttling. OONI Probe -- Measures specific cases of network interference. SamKnows -- Performance testing platform that runs several tests to check performance and quality of network connections. DiffProbe (coming soon) -Determine whether an ISP is giving some traffic a lower priority than other traffic. Shaperprobe -- A test designed specifically to test traffic shapping. Windrider -- Test to detect whether mobile providers performed application or service specific differentiation. Pathload2 -- Tested the available bandwidth of Internet connections. Click on any of the available tests to open the tests main page on the Measurement Lab website. Each page includes information on the test that you may want to read before you run the test. Just click on "start test" if provided to run the test and wait for it to complete. All tests can be run without plugins or runtime libraries such as Java or Flash. Each analysis provides results and detailed information on the test. 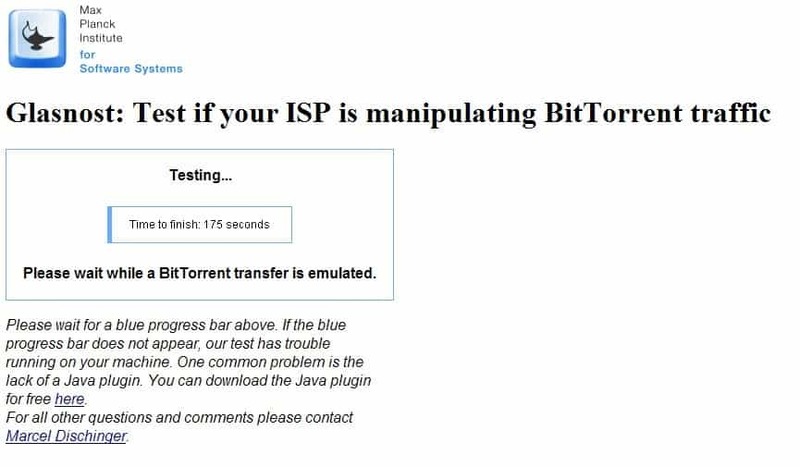 When you run the Network Diagnostic Tool test for instance, you get the Internet connection's upload and download speed returned on the test results page. You may click on details or advanced to display lots of information that the text collected. In this case, it collected packet loss, TCP receive window data, round trip time, timeouts, TCP time-out counter, and lots of additional collected data points. Some tests may require that you select a server to run the test on. To achieve best results a server closest to you should be selected when you run the test. The only situation where this should not be done is if you need to analyze the connection to a specific region. The speed analysis provides the means to identify problems with the connection or certain protocols. 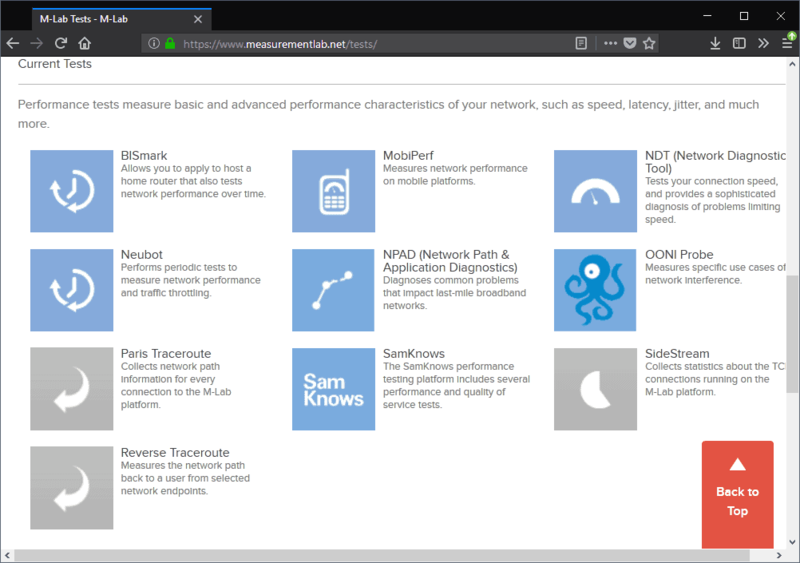 The article takes a look at the Internet connection test tools of Measurement Lab which help you find out if your ISP or someone else throttles your speed. If you detect that your Internet Provider is limiting your connection speed, so what? There aint a gattdam thing you can do about it. Well it depends. I live in a place where we can select from dozens of Internet Providers and it is easy to change to another one. If you live in a rural area or somewhere where one Internet Provider has a monopoly it could be problematic.